Home » Features » Southern Lights: Going By The Review, Is Ajith’s Film Better Than Rajinikanth’s? How do star ratings work? 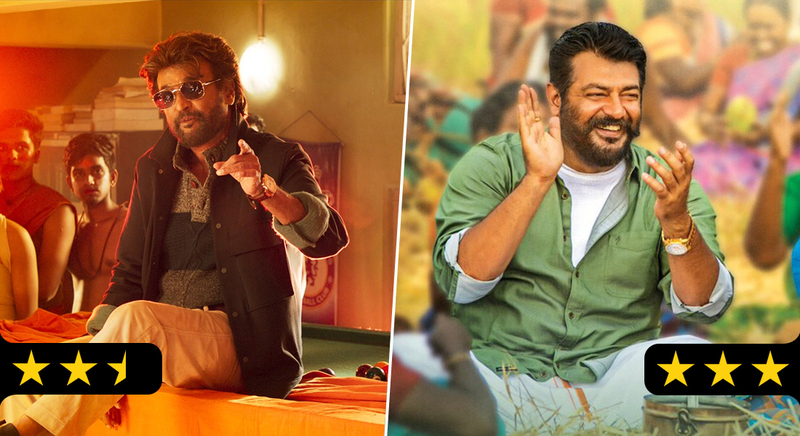 I gave Petta 2.5 stars and Viswasam 3 stars – so does this mean Viswasam is a better film than Petta? No. Firstly, you cannot even compare the two genres, just because these films are in Tamil and happen to feature two huge stars. You cannot compare The Sound of Music with 2001: A Space Odyssey. It’s apples and oranges. Even within the same genre, you cannot compare, say, The Sound of Music with Lars von Trier’s Dancer in the Dark. Yes, they’re both musicals. Yes, both narratives are woven around a female character. But one’s uplifting and mainstream, the other one’s downbeat and arty – they’re just not from the same universe. You can only compare films that exist in the same universe. So what the star rating means is this (and if you’ve read and agreed with the other 5000 articles, you can stop reading now, for there’s very little you won’t know): a film’s rating is about how, in the critic’s opinion, the film achieved what it set out to do, what it was trying to be. Had Petta been ridiculously bad (or with very few redeeming factors), I’d have given it 1 star or 1.5 stars. So what was Petta trying to be? I don’t put much stock in what the director says his film is, or what he was trying to do. Why? Because what one tries to do and what one ends up doing may be two very different things. What’s important is what the film has ended up being. In fact, had I evaluated Petta on what Karthik Subbaraj has claimed he wanted to do, my rating would have probably been even less – for I don’t think Petta exactly “brings back the 90s/80s Rajini”. The first half, yes. It’s filled with direct references as well as delicious Easter eggs. But the second half is not the 90s-Rajini universe at all. It is the Karthik Subbaraj universe. The Rajini of the first half is the moral Rajini we know – the man who stops students from being ragged, the man who prevents an inter-faith couple from being harassed. This is the heroic Rajini, who prevents the bad guys from doing bad things. And had this been the flavour of the second half as well, my rating would have probably been 3.5 stars. The pre-interval Rajini film doesn’t mesh with the post-interval Karthik Subbaraj film. It’s half-and-half. Hence, two-and-a-half. The rating made sense to me at the time, and I don’t see why so many people are claiming I hate the film. Far from it. I don’t love it unreservedly, but there’s so much to like and appreciate. But the second half deposits Rajini in the morally murky world of Karthik Subbaraj, where he’s no more a hero but an anti-hero — he gleefully plots (and executes) the murder of a man who’s become a thorn in the flesh. This is easily one of the all-time-great sequences I’ve seen Rajinikanth in, but it’s not a “Rajini sequence.” And it doesn’t gel with the Rajini character from the first half. The twist at the end, with the story of Rama and Vaali – again, an all-time-great sequence featuring Rajinikanth, but not really a “Rajini sequence”. The moral universe of the first half – the Rajini universe – has been upended. Now, had this been the flavour of Petta throughout – i.e., had it been an out-and-out Karthik Subbaraj movie, with Rajinikanth as an amoral gangster – then that would have been great, too. In fact, given a choice, that would have been the movie I’d have preferred, for I’ve always loved the bad-guy Rajinikanth (Moondru Mudichu, Billa, Enthiran, 16 Vayadhinile, Netrikann, and above all, Avargal, where he played a glorious sadist), who mostly vanished after the actor attained Superstar-dom. To see that Rajini in a Karthik Subbaraj universe? The mouth waters. That would have been, I think, a movie worth 3.5 stars. Maybe even 4 stars. What about Viswasam, then? Why does it rate 3 stars? Because that’s a simpler narrative. The writing is clean. (The screenplay is much more organic than that of Petta, with every plot point providing the requisite ricochets, like coins on a carom board.) The flavour is the same from start to finish. The star, Ajith, is used the same way from start to finish. (The film is set in his universe throughout.) What Viswasam promises in the first fifteen minutes, it delivers through the rest of its running time. So, for its type of film (and NOT in comparison with ‘Petta’), Viswasam rates 3 stars. So what are the films you could compare a Viswasam with? Veeram, most certainly – not just because it’s the same star/director combination, but because the two films are similar in sensibility. What about Yennai Arindhaal? That’s an Ajith movie, too, right? But that is a very different sensibility. It makes more sense to compare that film with, say, Kaakha Kaakha, or Vettaiyaadu Vilaiyaadu. Unlike Veeram or Viswasam, the driving force there is not just the star but also the director. And what about Petta? What films would you compare it to? It’s hard to say, because it’s so unique. It may be the only film in Tamil cinema where a director with his own sensibility fan-worships a major star and yet tries to make his own movie. And just for this, the star rating is probably irrelevant. Should you go see the film? Absolutely. You’re probably thinking that star ratings are supposed to make it easier to judge a movie, whereas I am making it sound more difficult. Even I find it a very imprecise system, especially when my reviews are not targeted at the casual audience member who asks the question: Is this film worth a watch? (My answer is always: How do I know what your tastes are?) But we have to live with the star rating, and if it bothers people so much, I always advise them to read the review to get an idea of what I thought about the film. But if you say “Who has the time to read?”, well, whose problem is that?